Reeds Spring High School’s wrestling team competed in the district tournament on February 8-9 in Monett. 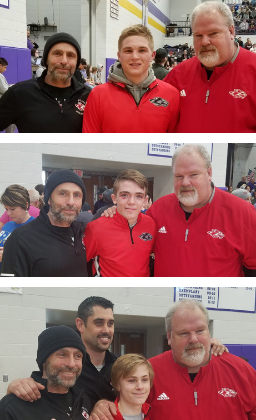 Three Wolves placed in the top four of their weight classes, earning the right to compete at the state meet, which will be held February 14-16 in Columbia. Freshman Tyler Nance finished fourth in the 113-pound weight class. Sophomore Eric Holt finished third in the 132-pound weight class, and senior Clayton Johnson was second at 170 pounds. This is the second year in a row for Holt and Johnson to compete in the state championship. The team finished tenth overall. The RSHS boys basketball team lost two games last week, falling to Rogersville 76-37 and losing to Aurora 47-44. Against Rogersville, Troy Froeschle led the team with 12 points and Lance Hafar scored 11 against Aurora. The JV team also lost to Rogersville but defeated Aurora. The Lady Wolves split a pair of games last week, falling to Rogersville 74-33 and beating Aurora 52-37. Senior Kalena Asbill scored 25 in the victory over Aurora.